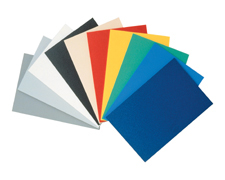 An affordable, durable, lightweight and moisture resistant foam board. Sintra can be cut, routed, machined, heat-formed or bonded. It's easily painted and can be used effectively with vinyl lettering and many adhesives. This foam core is great for screen printing, models, displays, exhibit booths, indoor and outdoor signs, and photomounting. UV Resistant. Due to packaging requirements, in certain areas of the United States this item is only available in Carton Quantities. *THESE SHEETS ARE OVERISZED. UPS FEES DO NOT APPLY! PLEASE CONTACT US FOR A FREIGHT QUOTE TO YOUR AREA AT [email protected]. OTHERWISE, FREIGHT WILL BE ADDED ON AFTER CHECKOUT. *SINTRA PVC BOARDS CAN BE CUSTOM CUT TO SIZE. PLEASE INQUIRE BEFORE ORDERING.